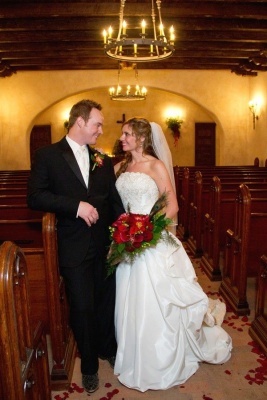 Brittany and Matt got married at Lost Mission in Boerne, TX on November 26, 2011. It was a great wedding that was themed with deep red and peacock colors. Brittany and Matt exchanged vows in the most moving ceremony that I have seen in a long time. They decided to include a communion for themselves that was very touching. The reception that followed was fun and the food and family atmosphere was great. They all enjoyed some great Mexican food and the photo booth that was provided by Straughan Photography! Jason and I were very happy to be apart of such a great day, congratulations Brittany and Matt!